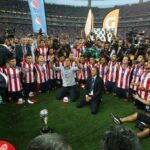 Chivas were leading Tigres 2–0 in the first leg of the Liga MX Clausura final, but then Andre-Pierre Gignac happened. He scored his first in the 85th minute, then, just three minutes later, he chased down a long pass that slipped through Chivas’ back line, hopped over the goalkeeper like Super Mario over a turtle shell, and lobbed a shot into the empty net at a tricky angle while falling backwards. That made it 2–2, completely swinging the momentum to the Apertura 2016 champions going into the second leg. Gignac now has nine goals from his last 15 shots. Not matches. Shots.